COMPATIBLE WITH IPHONE 6S, IPHONE 6, GALAXY S7, GALAXY S6, GALAXY S6 EDGE, GALAXY S5, MOTO G, MOTO E, MOTO X, DROID MAXX, DROID TURBO and OTHER DEVICES WITHOUT A CASE. Supports phones measuring 5.7 X 3.25 inches or less. Gear Beast Armbands are designed to fit your device without a case to ensure that the phone functions properly when inside the armband. ENHANCED TOUCHSCREEN SENSITIVITY FOR EASY PHONE OPERATION. 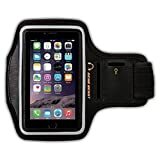 The Gear Beast Deluxe Armband is designed for every athlete or beginner seeking a higher performance running armband for their smartphone or iPod MP3 player. Our thinner, tougher screen protector provides improved access to your music and apps over competing armbands without sacrificing protection. PERFORMANCE AND COMFORT. Constructed of high quality sweat resistant neoprene that wicks moisture away from your device during workouts, this armband also features COMFORT PIPING on the outer edges to eliminate friction and discomfort caused by the unpadded edges of other sports armbands. MADE FOR EVERY TYPE OF ATHLETE. This armband comfortably fits arms 7 to 16 inches*. The improved strap design keeps the armband in place even during the most rigorous activities. *Armband Strap Extenders are sold separately to accommodate arms larger than 16 inches. Please search Gear Beast Armband Extender on Amazon. Armband features convenient KEY HOLDER and a REFLECTIVE SAFETY BAND that increases visibility during low light and nighttime activities. Be Seen and Be Safe! Tired of armbands that fail to perform? So are we! That is why we created the Gear Beast Deluxe Armband. Building off of the success of our industry leading line of sports armbands, we refined the Deluxe Armband for runners and other athletes looking for added comfort and better performance. Constructed of high quality sweat resistant neoprene, this armband protects your phone from sweat and reduces that itchy feeling after workouts. In addition, Comfort piping added to the outer edges eliminates the friction and discomfort caused by the unpadded edges of other sports armbands while an improved strap design keeps the armband in place even during the most rigorous activities. Like to run early in the morning before the sun comes up or in the evening? Reflective Safety Band ensures that you are seen while running when it is dark outside. No need to carry your keys in your hand or tie to your shoelaces. The Deluxe Armband has a convenient key slot to safely hold your house key or car key during runs or workouts. Our thinner, tougher screen protector provides improved access to your music and apps over competing armbands without sacrificing protection.